Seller is a business unit belonging to Boscagrafic SL, with CIF / NIF B-97629414, domiciled Industrial Estate 46819 La Vila Novetle (Valencia). 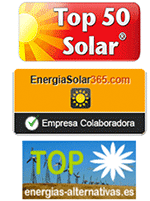 Any notification may be sent to the registered office or email info@tienda-solar.es. The Seller sells a distance, preferably online, of renewable energy equipment. Seller reserves the right to modify the commercial offer presented on the website (changes to products, prices, promotions and other sales and service) at any time. Seller makes every effort within its means to provide the information contained in the website is accurate and no typographical errors. In the case that at some point an error of this kind at all times outside the control of Seller occurs, immediately be corrected. There is a typographical error in any of the displayed prices and a client has made a purchase decision based on that error, Seller will notify the client of the error and the customer is entitled to cancel the order at no cost to you. The website content Seller may, at times, show provisional information on some products. In the event that the information provided does not correspond to the characteristics of the product the customer is entitled to cancel the order at no cost to you. Seller is not responsible directly or indirectly from any of the information, content, statements and expressions containing products sold by Seller. This responsibility falls to the manufacturers or distributors of such products. Customer understands that Seller is a mere intermediary between him and that manufacturer or distributor. • Internet through the "shopping cart"
• Internet through the "order off-line 'or e-mail. The prices of products displayed on the website of The Seller, include Value Added Tax (VAT), if any, is applicable. Purchases will be delivered within the territory of any member state of the European Union are subject to VAT. Purchases must be handed in territories not members of the European Union, or the Canaries, Ceuta and Melilla are exempt from VAT. When ordering, the customer can choose to pay the purchases made by bank transfer or Paypal secure payment or other similar means. In certain cases and to prevent fraud, Seller reserves the right to request a customer a specific payment in the event that is not proven conclusively the identity of the buyer. The customer can choose the shipping method from the potential for shipping area. You should be aware that the delivery, quality of service, the point of delivery and the cost will be different for each form of transport. Transport times can be altered by extraordinary incidents in the transport and difficulties in delivering the goods. Shipping charges listed on the website when ordering are approximate and are calculated based on an average statistical weight. Seller reserves the right to alter the shipping costs when the requested weight varies by plus / minus 10% from the average weight mentioned. If a price change occurs, notify Seller via email to the customer variation and the customer may choose to cancel your order without any cost attributable to him. Seller does not guarantee its customers the availability or delivery of the products offered on its website except for the products in a given warranty expressly stated. The catalog is a guide only shows as manufacturers or distributors not communicate stocks advance or guarantee deadlines. This situation prevents the possibility of Seller accurately inform their clients about the availability of the products and to ensure a final date for delivery, if at all, will depend on the period of time the manufacturer or distributor in supplying the product . Seller guarantees its customers the option to cancel your order at any time and at no cost provided that the cancellation is communicated before the order has been made ​​available to the carrier for shipment. The client will have a period of seven days from receipt of the order to the contract and return the product purchased. The customer shall notify Seller within the stipulated time and for any lawful means, his desire to exercise the right to terminate the contract. The returned order must be delivered together with the delivery note and your invoice, if issued to Seller, Seller running with the cost of return. The customer may return any item you purchased from Seller provided that the product has not been opened or used and retain their original packing or seal. In these cases, Seller shall return the purchase money through a credit to the credit card, by bank transfer to the account specified by the customer or credited to your personal account. If a different product requested by the customer was delivered by Seller error, it will be removed and you will be given the correct product at no additional charge to the buyer. For any incident related to the return of items in our store, please contact our customer service department via email: info@tienda-solar.es. The client Seller agrees at all times to provide truthful information about the data requested in user registration forms or placing an order, and keep them updated at all times. The customer agrees to accept all terms and conditions contained in these Terms of understanding that reflect the best possible service for the type of activity carried Seller. Also agrees to hold in confidence and with the utmost care their personal access codes to our website. The customer agrees to allow the delivery of the order providing a delivery address where your order can be delivered within the usual delivery time of goods (Monday to Friday 10:00 to 13:30 and 16: 00 to 18:00). In case of default by the client of this obligation, Seller shall have no liability for delays or failures in delivery of the order requested by the customer. The purchases made with the Seller are subject to the laws of Spain. In case of any conflict or inconsistency, the applicable jurisdiction will be the courts or tribunals of the buyer.